1. Arrange chicken breasts in a single layer in a shallow glass or ceramic pan. Whisk the lemon juice, olive oil, garlic, and rosemary together in a small bowl and pour over chicken breasts. Let marinate in the refrigerator, turning once or twice, at least 4 hours. 2. Grill the chicken breasts 5 to 6 inches above the hot coals 4 to 6 minutes per side, brushing with any marinade remaining in the dish. Serve at once. Thaw fish, if frozen. Preheat broiler. Place bread crumbs in a shallow baking pan. Broil four inches from the heat for one or two minutes, stirring once, until lightly toasted. Set aside. Measure thickness of fish. Place fish on greased unheated rack of broiler pan, tucking under any thin edges. Broil four inches from heat for four to six minutes per ½ inch thickness or until fish flakes easily with a fork. Turn one-inch thick fillets over halfway through broiling. Meanwhile combine mayonnaise and pesto; set aside. Combine toasted breadcrumbs and Parmesan cheese. Spoon mayonnaise mixture over fillets. Sprinkle with bread crumb mixture. Broil one to two minutes more or until crumbs are lightly browned. Makes four servings. Heat one Tbl oil in a skillet over moderately high heat until just smoking, then sauté three pieces of fish, turning over once with a spatula until golden and just cooked through, four to fie minutes total, and transfer to a plate. Sauté remaining three pieces of fish with the remaining oil in the same manner. Serve with a dollop of chili lime butter. Pound chicken breast with mallet until thin. Lightly brown in 2 tsp. butter. Remove and set aside. Melt remaining butter in same sauté pan. Add shallots and mushrooms and cook until lightly browned. Add Marsala and bring to a boil, scraping up any brown bits from bottom of pan. Add cream and lemon juice and return to a boil. Season with salt and pepper. 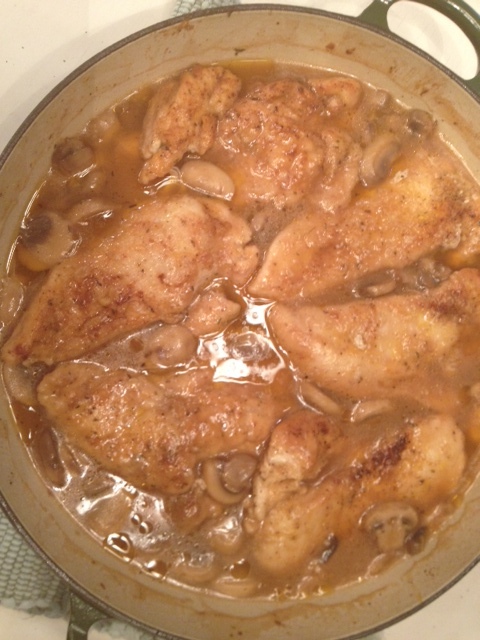 Return chicken to pan and continue cooking until done, turning chicken as needed. Serve with cooked pasta and garnish with freshly grated Parmesan cheese.